Fits Ducati 748/ 916/ 996/ 998/ 749/ 999 / SS900/1000 / Sport1000. 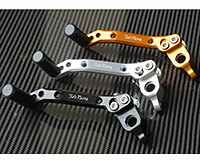 Adjustable brake pedal replaces the stock Ducati brake. Works great with Sato 'type1' Rear Sets for Ducati. Silver (clear) anodized billet aluminum with Delrin pedal tip. NOTE: SATO RACING parts are designed for track use. be installed by a certified mechanic.